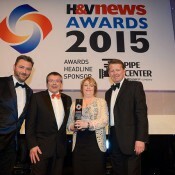 R A Brown Managing Director, Richard Brown and Commercial Director, Louise Howlett attended a ceremony with over 1,100 of the best companies across the building services industry at the Grosvenor House Hotel in London, where the winners of the 21st H&V News Awards were announced. R A Brown were finalists for two awards on the night, Retrofit Project of the Year and Off-grid Installer of the year and were really pleased to bring home the trophy to Norfolk for Retrofit Project of the Year 2015. The project which was showcased for the award, was the Emmanuel Church community rooms in Bungay. The community group created an environmental improvement project called ‘Going Green’ to oversee all the improvements to the community room. R A Brown fitted the Ground Source Heat Pump using bore holes and the project had already had Solar PV fitted. You can read further details on the work in the projects section of the R A Brown website. The Emmanuel Church Community Rooms has also benefited in being able to apply for the Non Domestic Renewable Heat Incentive, which has meant they are receiving a payback for their investment. 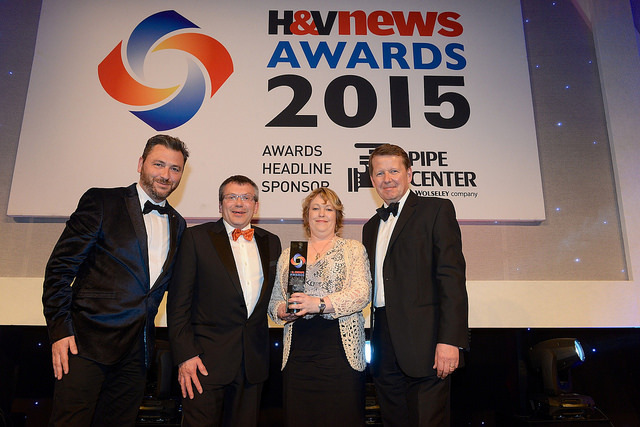 R A Brown are also current holders of Domestic Installer of the Year from the National Heat Pump Awards and have previously won H&V News awards in 2013 & 2014 for Rural Heating Installer of the year and Energy Efficient Installer of the year.